For an in-depth explanation of this finance table please click here. We act as credit brokers and we are not a lender. †Includes £2,000 Deposit Allowance Paid By Manufacturer. *Excess mileage charge of 8p per mile. If you exceed this annual mileage then excess mileage charges will be applied by the finance provider at the end of the agreement should you choose to return the vehicle. Finance subject to status. A guarantee may be required. Terms and conditions apply. Unless otherwise stated, metallic paint at extra cost. Library image for illustration purposes only. 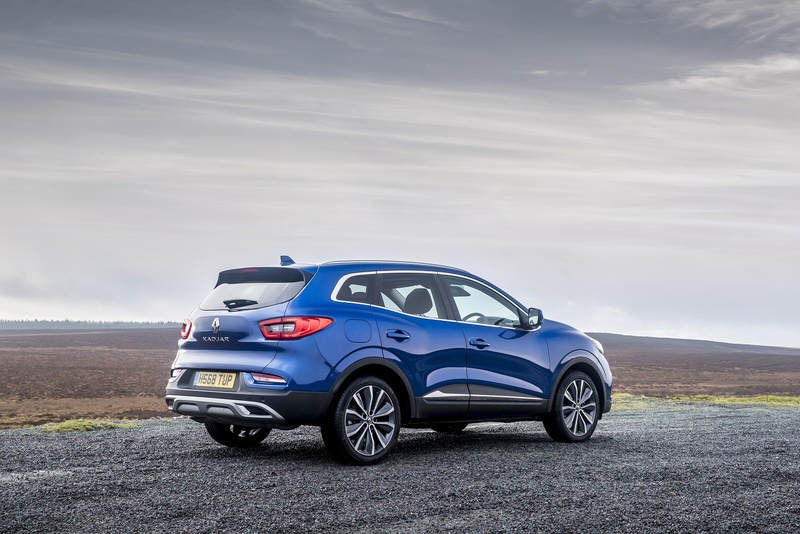 Renault's Kadjar is a family-shaped mid-sized SUV model that's smart, sensible and, in its way, quite aspirational. 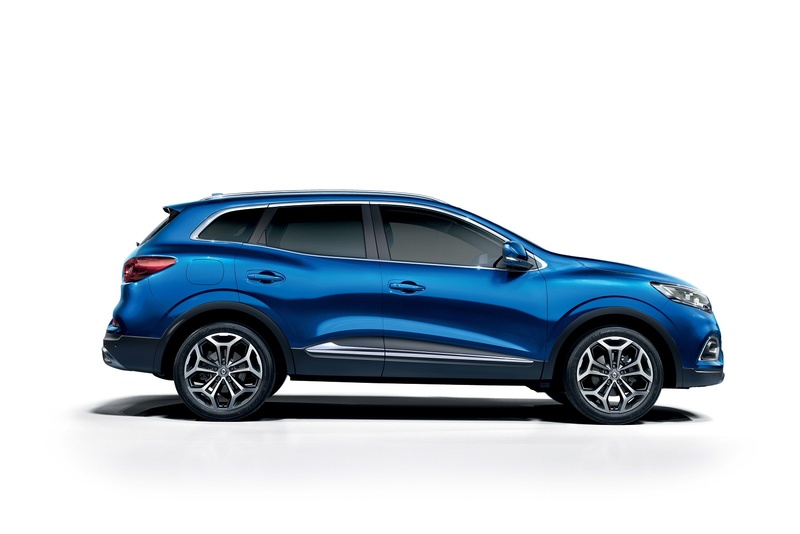 As before, this lightly revised version has been developed from much of the same technology that brought us the segment-leading Nissan Qashqai. It's certainly a more interesting family choice than that Focus-class hatch you might have been considering - and there's the option of 4WD if you want some substance to go with the style. That name first. That had us all guessing. North African tribe? Middle Eastern trade wind? Wrong and wrong. Apparently it's one of those portmanteau French words where 'Kad' is inspired by the world 'quad' (the casual term for a four-wheeled all-terrain vehicle) and 'Jar' is a reference to the French words 'agile' and 'jaillir,' which means to 'emerge quickly'. Still, this is the crew who brought us Kangoos and Twizys, so perhaps it's best not to linger. It's pretty easy to position just what this car is though. Big brother to the smaller Captur crossover, slightly more compact than the bigger Koleos crossover, it's spun off the same platform as alliance partner Nissan's huge-selling Qashqai. 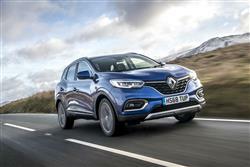 Renault reckons there's enough room in the market to go poaching sales from the likes of Volkswagen, Kia and Toyota rather than merely cannibalise Qashqai sales. Let's take a look and see if they're still onto something with this revised model. The key change here is the addition of two fresh engines to the range. Well actually, they're now the only engines available in the range, though each can be had in a couple of states of tune. The first unit is the one you might be primarily drawn to given the current zeitgeist, a 1.3-litre four cylinder Tce petrol unit putting out either 140 or 160hp. This powerplant is a decent improvement on its 1.2-litre predecessor and develops its pulling power from low down, which should make town driving easier. Rest to 62mph in a Tce 140 derivative takes 10.4s en route to 126mph - or 9.6s if you opt for the extra-cost EDC automatic version. The Tce 160 variant (which can only be had in manual form), manages 62mph from rest in 9.9s on the way to 130mph. If you fancy a diesel, you'll be directed towards a 1.5-litre Blue dCi unit offering either 115 or 150hp. Again, it's the lower-powered unit that offers the EDC automatic option. A manual 1.5 dCi 115 variant manages 62mph from rest in 11.7s en route to 117mph. As before, the basic suspension set-up (like virtually all the engineering) is carried over from this model's cousin, the Nissan Qashqai, albeit with some Renault-specific tuning. 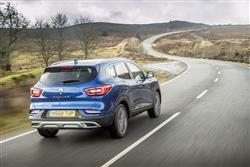 It makes a Kadjar manoeuvrable in town, with a tight 10.72m turning circle, and the driving position has been designed to mirror that of a typical saloon, rather than a high-set 4x4. The front-wheel drive versions are fitted with an 'Extended Grip' system, which is claimed to enhance grip on low-traction surfaces. Four wheel drive is only available on the top 150hp diesel model. The all-wheel-drive system offers three specific modes: Auto, Lock and FWD. 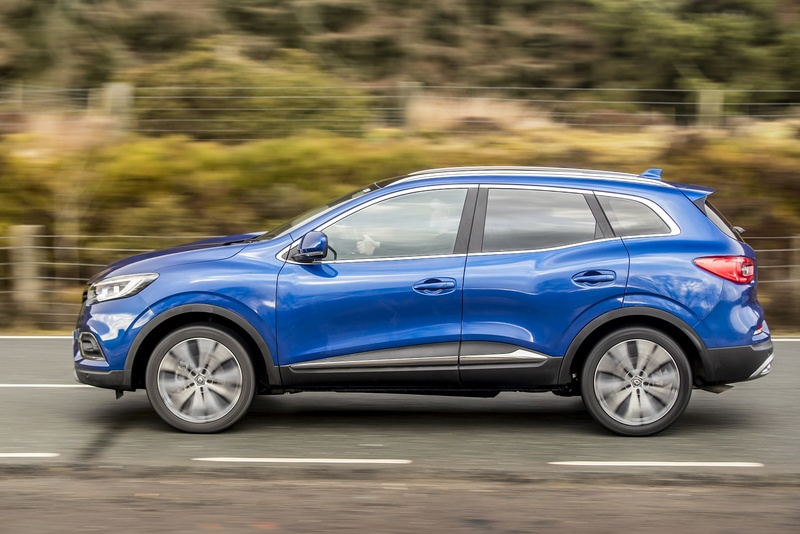 If you do choose to take the Kadjar off the beaten track, a 19cm high ground clearance lends it some ability, while front and rear skid plates will help if the 18 degree approach and 25 degree departure angles prove insufficient. 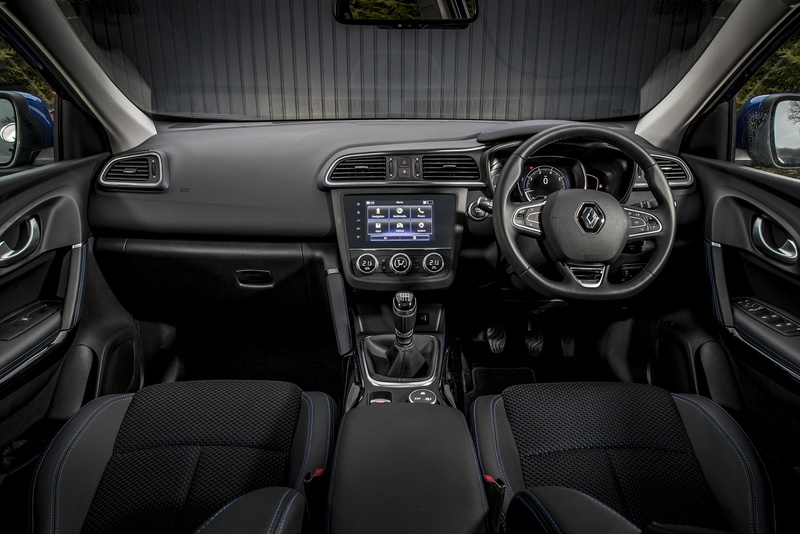 Unlike you happen to be a Renault sales person or an owner of the original version of this car, you'll struggle to notice any changes made to the exterior. 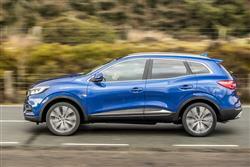 So, as before, the Kadjar looks like a scaled-up version of Renault's smaller Captur SUV - which is no bad thing. 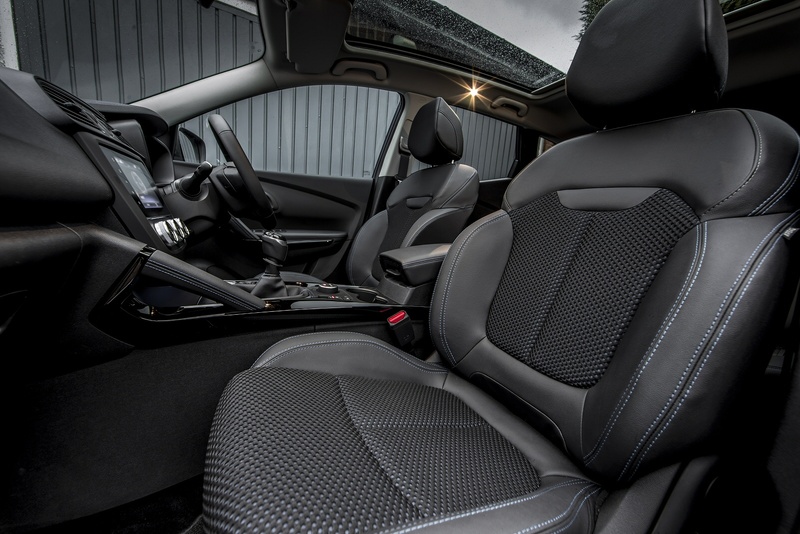 Of more importance is the news that the interior of this car has been treated to a much-needed re-fettling. The fascia has been given a new 7.0-inch centre-dash touchscreen that's a big improvement on what was offered before. There are smarter instrument cluster displays too. 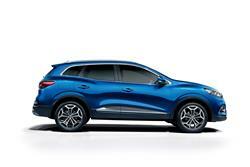 Otherwise, things are much as before, with an underlying structure shared with this model's Renault Alliance cousin, the Nissan Qashqai. 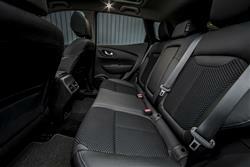 It's slightly more spacious in the back than that car mind you. And the boot is a useful 42-litres bigger than a Qashqai's at 472-litres to the tonneau cover. 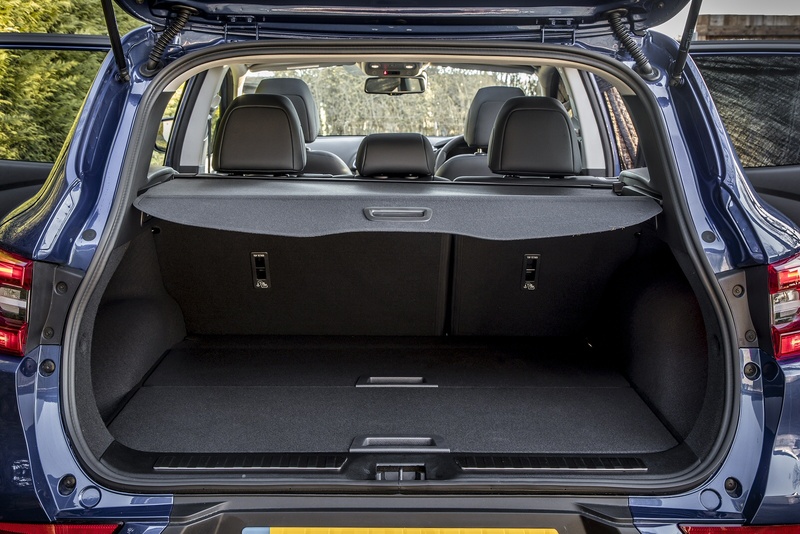 You get handles that drop the rear seats in their 60/40 split, an organiser that prevents your shopping spilling all over the boot when you corner and a split level load floor. There's also 30-litres of oddments storage around the cabin and the front passenger seat can even be folded to use as an impromptu table. Pricing starts at just over £20,500 and runs up to £30,000, so conforms to the class norm. There's the choice of four trim levels - 'Play', 'Iconic', 'S-Edition' and 'GT Line'. Even the base 'Play'-trimmed versions are well equipped, with 17-inch alloy wheels, tinted windows, front fog lights, auto headlamps and wipers and rear parking sensors. 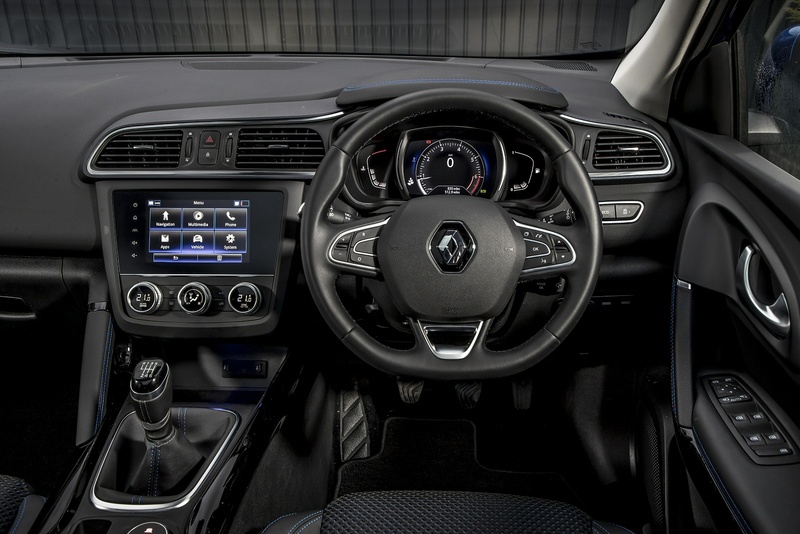 Inside, all models get Apple CarPlay or Android Auto smartphone-mirroring marshalled by a 7-inch centre-dash screen. There's also cruise control, automatic climate control and a synthetic leather steering wheel, plus an electronic parking brake, large cupholders, a sliding armrest and ambient lighting. Move up to an 'Iconic' model and you get 19-inch wheels, front parking sensors, a reversing camera, roof bars and navigation. The 'S-Edition' versions get full-LED headlights, a panoramic sunroof, front and rear skid plates and special seat stitching. And the top 'GT Line' derivatives vcome with full-leather upholstery, heated front seats and a 360-degree surround view camera system. 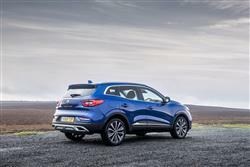 As we've said, the 1.3-litre petrol and 1.5-litre diesel engines that feature in the Kadjar are the same as those used by the similar Qashqai - and of course get much the same excellent efficiency figures. The 1.5-litre dCi diesel unit is the engine to choose if you feel that fuel station pasties and chocolate bars are sabotaging your fitness regime. This gets 65.7 miles per gallon and 134g/km of CO2 - and the 150hp version of this diesel isn't that much worse. Go for the petrol 1.3-litre TCe 140 variant and you'll manage 134g/km of CO2 and 47.9mpg on the combined cycle. 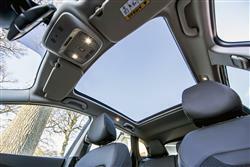 All versions provide the peace of mind of Renault's 4+ warranty and assistance package. The car is protected against defects recognised by Renault for four years or 100,000 miles (first two years have no mileage limit). 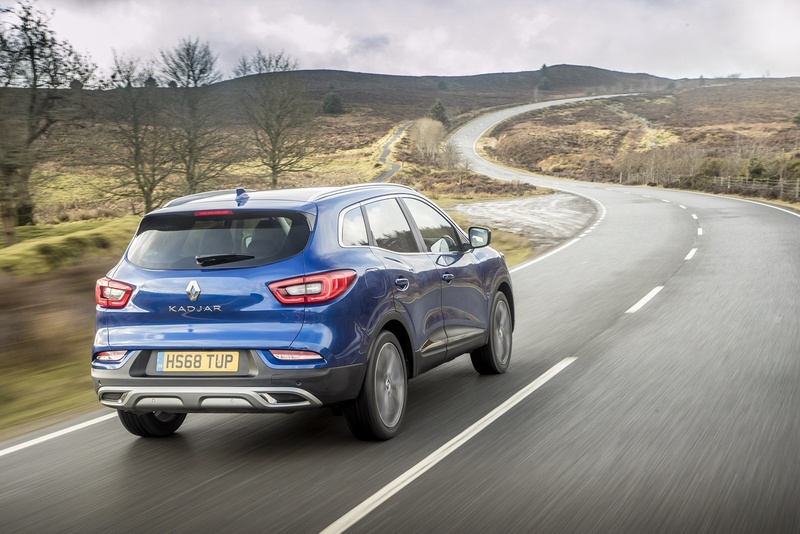 In the event of a breakdown, Renault provides emergency roadside repairs or towing to the nearest dealer 24/7 every day of the year, plus three years' European cover. There is also a three-year paint warranty and 12 years' cover against corrosion. Servicing is required once a year or every 18,000 miles. 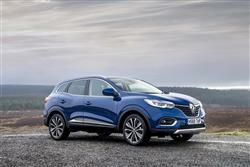 If you�re looking for a new Renault Kadjar 1.5 Blue dCi Iconic 5dr EDC Diesel Hatchback for sale, you�ve come to the right place. At Bristol Street Motors we don�t just have the best Renault Kadjar 1.5 Blue dCi Iconic 5dr EDC Diesel Hatchback deals, we also offer friendly advice and help with all your enquiries to ensure your buying experience is a happy experience.